A light not only illuminates the way but also your heart, giving you a little extra security as well. Solar-powered garden decorative lights help brighten and beautify your yard. 1. Make sure you turn ON the switch before charging. 2. It¡¯s optimal to charge for 8 hours with direct sunlight. 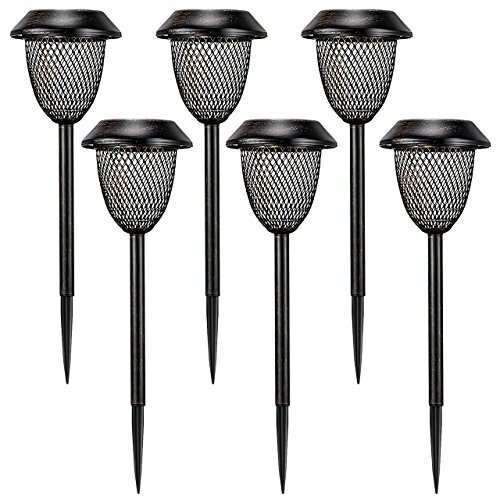 Unique Design, Romantic Decor: Victsing Outdoor solar lights has a unique appearance. The warm glow goes through the hollow-out net, casting a warm, romantic, safe, soft glow to the surroundings. It¡¯s easy for you to make decorations and create a romantic atmosphere in your garden. Efficient Operation, Energy-Saving: Victsing solar light utilizes efficient panel, the photo-voltaic conversion rate is over 20% to achieve higher efficient charging, providing environmental protection and energy saving. Just put it under the sun to absorb solar energy, and then the solar panel will efficient charging. Auto On/Off, Longer Working Time: The solar light will automatically turn on at dusk and off at dawn. The built-in rechargeable 600mAh battery enables the light to last for approximately 8-10 hours with only 6-8 hours to get fully charged. NOTE: The longer it absorbs the sunlight, the longer it can illuminate. Easy Installation, Never Cumbersome: There are no wires to install the light. Just need several steps to setup when you install it anywhere you like. Remember to turn on the switch before plug it into the ground. The night spirit will light your way in the dark. Weather Resistance, Excellent Serve: With the anti-corrosion metal material, it is durable to use. Waterproof design makes the light withstand all types of outdoor environment. No worry about rain, snow, etc. Every VicTsing product enjoys a 12-month worry-free guarantee & 60 days money back Guarantee.